It all started with the snippet of “Bittoo sab ki lega” in the promos, which went viral earlier this year. The song soon stoked the ire of Censor Board who asked for a cleaner trailer, which the producers refused and that phrase has entered the filmi lexicon. This audacious move by the makers certainly got the audience anticipating the rest of the music. One might have thought that the rest of the songs might be in the same naughty vein as a ‘Bhaag DK Bose’. Along with the music, and hero Pulkit Samrat looking like a distant relative of the Delhi Boy played by Ranveer Singh in Band Bajaa Baraat, the movie certainly looks to capture on the success of their previous Pyar Ka Punchnama. Unlike our expectations, the music is a mixed bunch of tracks that totally get you into the party mood. Hitting off we start with the track that got us excited, Bittoo Sab Ki Lega, and it’s a complete bawdy treat. Using a double entendre and gimmicks may have worked for the promo, but as a song, it’s even better with Mika Singh at the helm. We start off with phone snippets from wedding guests calling Bittoo, alongside an aggressive guitar riff and it gets you in that party mood. The mix of rock and the Broadway jazzy chorus is one that sounds so seamless together. Luv Ranjan is the guest lyricist on this track and the lyrics are a sheer delight! They may be bawdy and repetitive but the tune is definitely going to be the anthem for the younger crowd for a while. What can you say when Mika brings his typical Punjabi swagger to this track? Quite simply, he is fabulous on this track and clearly having fun in drawling out all those verses. The chorus gals, Neeti Mohan and Natalie Di Luccio, sound so great and sound so sultry, keeping with the Broadway style to the tune. Keep this one on repeat! One of the strengths on the album are both versions of Kaun Kenda, sung by Sonu Niigam and Shreya Ghosal. With the usual romantic song, we get a male and female version. The main version with Sonu Niigam and Shreya Ghosal is so easy on the ears. They sound so wonderful together and complement the Punjabi lyrics, which are quite eloquent here. The bridge speeds up the tempo to feature a qawalli part, which sounds so melodious and gives the song its edge. This nice breezy song definitely deserves a repeat. The Shreya Ghosal version features Shahid Mallya’s soulful background crooning and sounds so lush. As with the acoustic trend, this version is more laid-back with just the minor guitar strums during the beginning which allows Ghosal to showcase her delicate voice in this romantic tune. When the tabla comes in during this reprise, it assumes the same composition as the main version, but this one is solely brilliant for focussing on the vocals by Ghosal and Mallya. With this one, there is the treat of two so take your pick. Back to the raucous party spirit, we get into Kick Lag Gayi, which may remind some of an ‘Ainvayi’ from BBB, yet this one matches the fun-loving spirit but goes even further with its great lyrics. This one is sure to be on the set list for most wedding parties! Tulsi Kumar starts the track with verse of the Punjabi song ‘Latthe Di Chaadhar’ which gets the atmosphere peaked for what is to come. Raghav Sachar is clearly having a ball on this track, and it makes you wish he wouldn’t take such long hiatuses from the Bollywood music scene. The tumbhi, full blast on the dhol along with the folksy elements make this song so Punjabi, and immediately gets your arms up in the air. The lyrics are equally naughty, and create banter between the characters, which does not distract. The song does get bonus points for name-dropping Lady Gaga in a hilarious way. This song is one my favourites as it combines the folk sangeet song with a fast and infectious modern Punjabi sound. This version does feature a Remix, in the sense that it’s a redo with Master Saleem taking over from Raghav Sachar. This version amps up the desi sound with Saleem at the helm. Both versions sound great, and that is a complement to the Sachar’s great composition. We have two songs on the album with two versions that sound equally good, so again it’s up to you to choose! Next up is the fun, Audi (Tenu Tak De). The song is laced with some guitar riffs, which make this more than the run-on-the-mill Punjabi hip-hop tune we usually hear on most soundtracks. It sounds gritty and recalls a Salim-Sulaiman sound. The lyrics are quite good too, and Raghav Sachar has an authentic Punjabi twang that unfortunately beats the go-to man Neeraj Shridhar especially on a track like this. Natalie di Luccio’s backup vocals are fine and the English is not worded in the usual oddly verbose way. The song has a good vibe to it but it is the standard Punjabi track. However, this track is not the best of the bhangra songs on this album. To make up for the last one, we get a retro throwback in Kabootar, which is so enjoyable with Mika on the vocals. It does sound like more of a situational track to introduce the Bittoo Boss. The lyrics are quite novel and are fabulous in creating a gist of Bittoo. The song sounds like such a RD Burman throwback with the heavy tabla beats scattered throughout with a touch Bappi thrown in with the screechy chorus girls. The chorus is one the best parts of the song where all the elements come together so well in the crescendo and during the bridge. We end the album on a good note with, Mann Jaage, with Shahid Mallya taking over the Rahat territory. Mallya is very emotive and full of dard on this track and it does not make you miss the Rahat treatment. The long length of the song should not be a deterring factor as Mallya makes this song worth savouring with his effecting and lilting voice. The surprise santoor that comes midway through the track is the icing on the cake, as it just takes the song to a retro level that completely works. The Bittoo Boss album is likely one that will capture the youth with its unabashed fun quotient and perhaps please a music lover in need of some great party jams. Even if the film looks like a raunchier BBB, the music goes that one extra mile to distance itself and with the sprightly music, it’s definitely done half of the job. 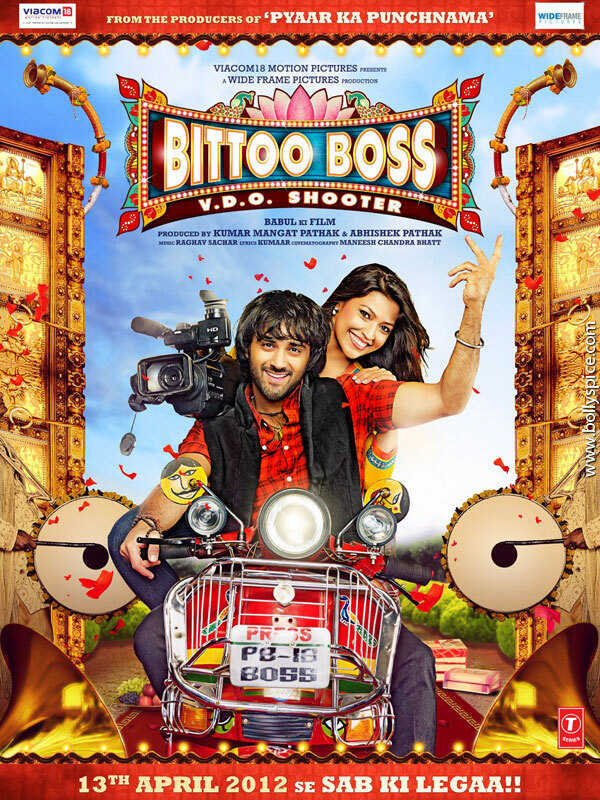 Here’s looking forward to the movie and if Bittoo will hum sabko lega! !